As more people take to bicycling for recreation and transportation it is nice to know there is someone to come to rescue if a bike breaks down. 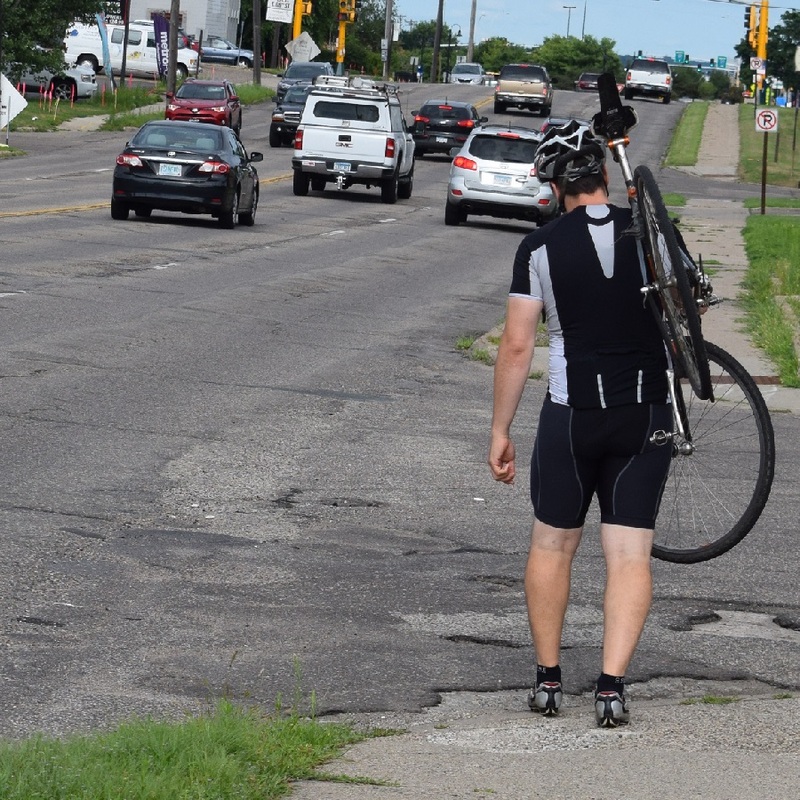 In a move to support bicyclists, AAA is now offering support. Recently, the company announced that it was extending its popular automotive AAA Roadside Service to include bikes. Here at HaveFunBiking.com, hearing the news is exciting. This is a perfect service that will assure cyclist, someone will be there if they breakdown. If this rider had AAA Roadside Service, he wouldn’t be carrying his bike home because of a mechanical issue. How the program works? For as little as $49 a year you can purchase a AAA membership that offers Roadside Service for both your car and bike. If you are already a member you are now covered when bicycling. Just call your roadside assistance number on the back of your membership card. Like the automotive Roadside Assistance Program any bike you are riding (road, mountain, recumbent, e-bike, tandem bikes, bike rentals and bicycle trailers) is eligible. Coverage applies to any qualified bike a member is riding at the time the bicycle becomes disabled. A member should be with the bicycle and have their AAA Membership Card in hand at the time of service. Keep in mind, the Roadside Service is provided only for the rider whose bicycle has become disabled or inoperable. However, any accompanying minors of a member is covered. The second most common mechanical problem to a flat tire is a broken chain. If a quick fix isn’t an option, (examples: you blew a tire; some spokes broke; or the chain busted) first call a family member or friend. Then, if no one is available to assist, AAA Roadside Service may be your best option. It’s like “Having a SAG Wagon in your back pocket,” especially when you are touring away from home, on vacation, etc. This roadside service is something that will give a cyclist peace of mind. The Premier: Gives you one transport of your bike or car, up to a 200-mile radius of the breakdown; remaining transports are 100 miles. Locksmith services, in case you accidentally lock up your bike and lose the key or combination. 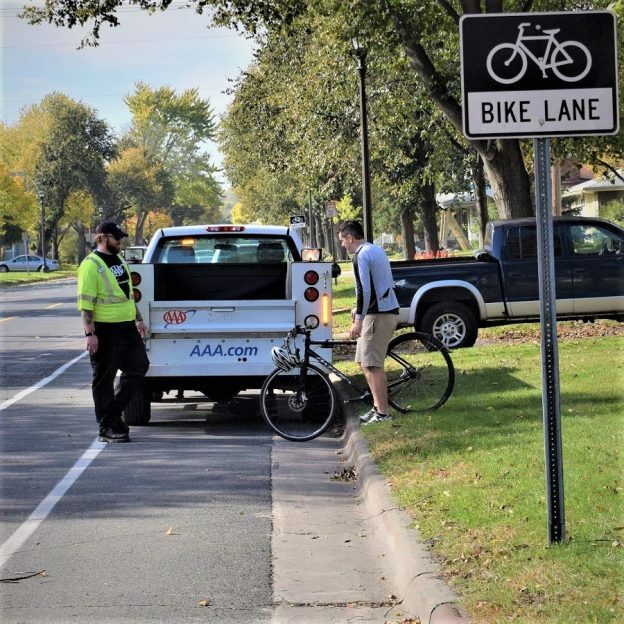 AAA Roadside Service is available in many states across the U.S.
“We are tremendously excited about this great new bike benefit program available to AAA members across most of the upper Midwest, Southeast and much of our country,” stated Gail Weinholzer, Director of Public Affairs, AAA – The Auto Club Group. The new bicycle service is available throughout the entire territory served by AAA. The Auto Club Group which includes all of: Florida, Georgia, Iowa, Michigan, Nebraska, North Dakota, Tennessee and Wisconsin; most of Illinois and Minnesota; and a portion of Indiana. For bicycle coverage outside the above states and for full details on AAA Roadside Membership visit AAA.com/Bicycle. This entry was posted in News and tagged #countonAAA, #FindYourNextAdventure, AAA, AAA Auto Club of Minnesota, AAA Roadside Service, AAA – The Auto Club Group, bike fix, Bike maintance tips, Bike repair, bike touring, bike trip, Family Bike Trip, free bike maps, Minnesota trails, MN Bike Guide, Roadside Repair, SAG Support, service and gear on August 7, 2017 by Russ Lowthian. One note, AAA will only pick you and your bicycle up if you are on a public road. If your breakdown occurs on a trail that is not adjacent to a road, you will need to walk it to a road crossing in order for AAA to assist.